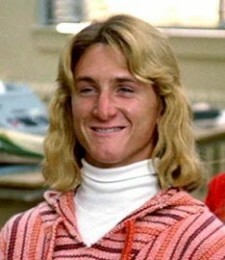 When I was an adolescent movies like Cameron Crowe’s 1982 Fast Times at Ridgemont High created a stereotype of teenage surfer dudes from “So Cal” in Sean Penn’s character, Spicoli, a burnout with no comprehension of future responsibility as an adult. If you know this movie, you probably already have Sean Penn’s face and his long, wavy, unwieldy surfer hair in your imagination. It was this kind of face and hair that I came across when I found some images of the artist Rick Griffin. And so, I quickly judged him by his looks: typical burnout surfer dude. There is probably some element of this surfer stereotype at work in Rick’s story, but as I found out there is way so much more. Rick was born in June 1944 in Palos Verdes, California and grew up in that area of So Cal and quickly became identified as a talented illustrator. At the age of 19 he had hitched a ride to San Francisco, preparing to catch a freighter to Australia. Rick had fallen asleep in the car, and when he woke up he found the driver laughing and the car careening out of control. The horrible car accident almost killed him, and he wound up in a morphine-induced coma. While in his coma he saw fantastic apocalyptic visions that fed his artistic imagination his whole life. Injuries scarred his face for life, which is why he grew his hair long and kept a beard. After he recovered, he made his way to San Francisco where he connected with the hippy scene, one thing led to another, and soon he was creating some of the most iconic artwork for the 1960s alternative music subculture. He designed album covers and posters for the most famous musicians of the day: the Doors, Jimi Hendrix, The Grateful Dead, The Who, Janis Joplin, and even some work for The Beatles. In the early 1970s through friends in the Jesus People, Rick went through some kind of Christian conversion and eventually hooked up with Chuck Smith of the rapidly-growing Calvary Chapel in Costa Mesa. 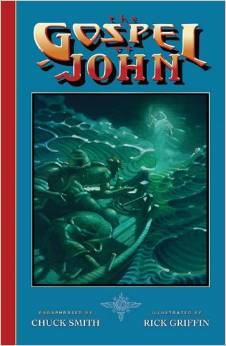 Rick illustrated a booklet on the Gospel of John as an evangelistic tool, written by pastor Chuck Smith. Rick then became Art Director of Marantha! Music and produced original artwork for the newly developing Christian music industry. Rick lived a complicated life and battled off and on with addiction to drugs, even well after he became a Christian. Some say his faith ebbed and flowed with his addictions. Life as an artist is a tough life, even when you’re acknowledged as one of the icons of a movement, such as Rick was within the uniquely American psychedelic art movement of the 1960s. It was a beautiful day August 15 of 1991 when Rick had just learned from his agent that one of his artworks sold at a gallery for $1800; he really needed the money. He got on his Harley to drive into San Francisco to meet the art dealer. On the highway on his way to the gallery he was passing a van when the van changed lanes and broadsided Rick. Just as had happened to him at age 19, Rick wound up in a coma for three days, except this time he didn’t make it out of the coma. 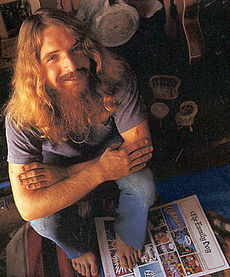 Rick Griffin died August 18, 1991 at the age of 47. He would have turned 70 June 18 of this year. Before I stumbled across this image of Jesus surfing I didn’t know anything about Rick Griffin or that he even existed, but I surely had seen his artwork here and there. I spent several hours reading about his life and examining his artwork because when I first read the basic facts of his life, I felt a kinship to him: my parents were born just one year before Rick; our families are from So Cal; and I, too, have a similar story of conversion. I think back to that August of 1991 when Rick Griffin died in that motorcycle accident. I was in my second month of being “born again” at the age of 23. I found new life in Christ. Rick’s complicated life ended in tragedy. Look at Rick Griffin’s image of Christ on the waves again. If I ask you, “Is this image true?” how would you answer? Whether or not artwork is “true,” “yes” or “no,” doesn’t make any sense. Maybe artwork reveals truth, but that seems to miss the point of artwork. People create art to express themselves, to show something with a fresh perspective, to juxtapose non-traditional elements to create new meaning, to inspire and give life to people, to give reality to imagination. Whether or not artwork is “true,” “yes” or “no,” doesn’t make any sense. Maybe artwork reveals truth, but that seems to miss the point of artwork. Sometimes the disciples acted like kooks. They just didn’t get it. They sought after things and accomplishments that were beyond their current ability or understanding. But Jesus set forth a way for the disciples to follow, to do even greater things! And yet the disciples were still so interested in some kind of end product or final revelation of the “Father” as the great Oz behind the curtain. This is the whole point of John’s Gospel, to clearly portray Jesus as the Christ, as the Messiah, as the One and Only God in the flesh. Some scholars even go so far as to say that verse six of chapter fourteen is the apex of the Gospel of John’s teaching: “I am the way, and the truth, and the life. No one comes to the Father except through me.” The ultimate point of John’s Gospel is that Jesus Christ is the way, the way that brings truth and life to the followers of his way. “Truth” and “life” describe the way. No one can follow this particular way by following anyone or anything else than Jesus. This is about the incarnation of God in Jesus the Christ. I don’t think the statement is about the inability of other world religions to generate encounter with the divine source of the cosmos. And I don’t think Jesus’s claim is about the capital “T” truth of Christianity over against all other world religions; that would be to pour into his words two thousand years of Christian history as a world religion and our contemporary experience with globalism and pluralism. Now, certainly, this is how this passage is often interpreted and used to degrade the “truth” of other religions and/or to elevate the truth claims of Christ and Christianity. That is a reasonable interpretation, but I think it has more roots in modern philosophy and the issues of post-colonialism than it does in the historical context of the passage itself, let alone its immediate figures of speech and grammar. The ultimate point of John’s Gospel is that Jesus Christ is the way, the way that brings truth and life to the followers of his way. “Truth” and “life” describe the way. No one can follow this particular way by following anyone or anything else than Jesus. 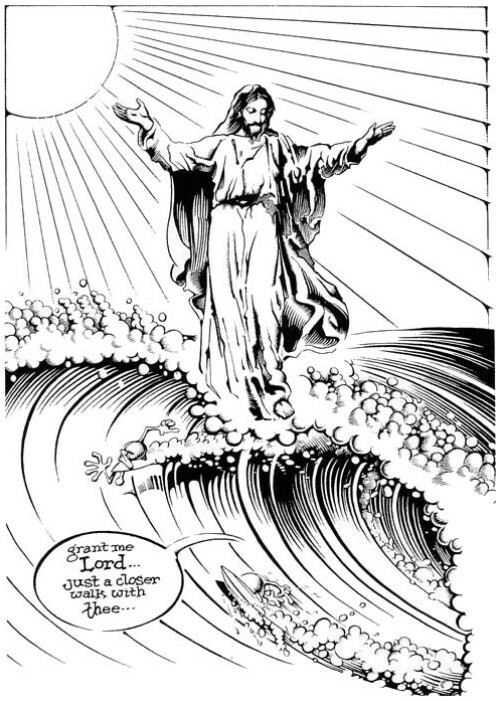 Now look at the surfing Jesus image again. Is your imagination and impression of the image changed? What does the image show us about Jesus as the way? 7 … 55he gazed into heaven and saw the glory of God and Jesus standing at the right hand of God. 56“‘Look,” he said, “I see the heavens opened and the Son of Man standing at the right hand of God!” 57But they covered their ears, and with a loud shout all rushed together against him. 58Then they dragged him out of the city and began to stone him; … 59While they were stoning Stephen, he prayed, “Lord Jesus, receive my spirit.” 60Then he knelt down and cried out in a loud voice, “Lord, do not hold this sin against them.” When he had said this, he died. Stephen followed in the way of Jesus. He proclaimed the gospel message and challenged his hearers to give up false idols, and then as he was being killed for his witness, in his dying act he truly followed the way of Jesus by asking God to forgive his killers. Yesterday a group of us here at PUMC were asked a question by Rev. John Bell of Wesley UMC in Aurora, “At the end of the day what kind of person do you want to be?” People remember Stephen for his speech and his martyrdom. People remember Rick Griffin for his expressive and prodigious artwork. Surely they both had shortcomings and struggles, but they did their best to express and share their faith with the talents God gave them. What kind of person do you want to be? How do you and will you follow Jesus as the way?